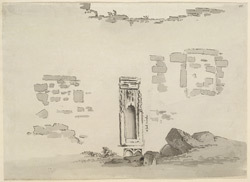 A drawing of a sculptured niche in a walk at Rewley Abbey. The Cistercian abbey was founded in 1281 by Edmund, Earl of Cornwall. It was also a college and Cistercian communities around the country would send an annual quota of monks to Rewley to pursue their theological studies. After Henry VIII closed down the monasteries in 1539 the abbey buildings fell into disrepair and today there are no remains.